There are three export options available for publishing websites that are created with Blocs. All three options can be accessed via the apps main menu File > Export. Please note. All settings that are applied via the advanced export options are automatically inherited by the quick export option. This export option gives you access to various options that can be used to help improve the performance of your site once it’s hosted. You can access this export option using File > Export > Export Project from the apps main menu or using the keyboard shortcut ⇧+⌘+E. If you are a developer creating 3rd party content for Blocs, you can find out if the clean URL structure is used on a page by checking the body tag for the data-clean-url data attribute which will be set to true. 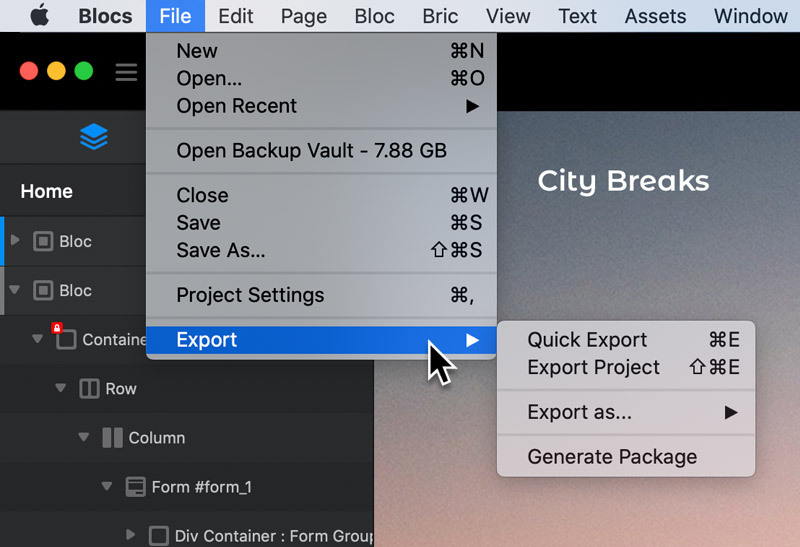 These additional export options let you export your site, page or even individual Blocs as various file types and templates. This export option is used to export a site to a Pulse CMS theme. 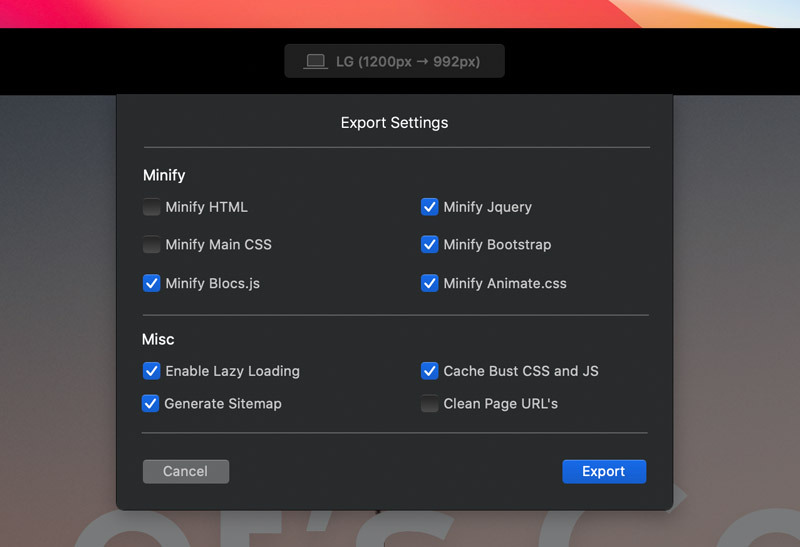 You can access this export option using File > Export > Export As > Pulse CMS Theme from the apps main menu. You can also read more about using content management systems with Blocs here. This export option is used to export a site to an October CMS theme. You can access this export option using File > Export > Export As > October CMS Theme from the apps main menu. You can also read more about using content management systems with Blocs here. This export option lets you export the currently selected Page as a custom Page template, that can then be distributed and shared with other Blocs users. You can access this export option using File > Export > Export As > Page Template from the apps main menu. This export option lets you export the currently selected Bloc as a custom Bloc template, that can then be distributed and shared with other Blocs users. You can access this export option using File > Export > Export As > Custom Bloc from the apps main menu. This export option lets you create a full size JPEG image of the current active page. This can be useful for quickly sending screen shots to clients without having to share your actual code with them. You can access this export option using File > Export > Export As > Image from the apps main menu.